Buckethead played a sold out show at Buffalo Iron Works on Monday, April 2nd. Here's the short version: I just paid $30 to see a man in a mask play a two-hour guitar solo against a pre-recorded backing track. And I did the exact same thing two days earlier, in Cleveland. Both shows were sold out. I'd do it again. If you already know about Buckethead, this makes absolute sense. If you don’t yet know about Buckethead, I’ve got some explaining to do. Buckethead is a virtuosic, avant-garde guitarist who—unbelievably—has released 305 studio albums to-date. His entire recorded output is more than 162 hours long. That’s almost seven straight days of music. He wears a KFC bucket on his head and an expressionless mask on his face. His highest profile gig was playing in Guns n’ Roses from 2000 to 2004, but he’s also played with esteemed musicians such as Bill Laswell, Bootsy Collins, Bernie Worrell, and Les Claypool. Why the mask and bucket, you ask? Sounds like cheap gimmicks. Well, before you jump to conclusions, let's take an abridged look at the evolution of rock musicians in character. The Beatles, in satin suits, pretended to be Sgt. Pepper’s Lonely Hearts Club Band. David Bowie, in unitard and partial-face makeup, pretended to be Ziggy Stardust. Gwar, in full-bodied rubber costumes, pretended to be monsters. The Parliament-Funkadelic collective, in outlandish outfits, adopted science fiction themes to explain their otherworldly sounds. Kiss, in spiked leather and full-face makeup, pretended to be intergalactic comic book characters. Sun Ra… no wait, Sun Ra actually was from outer space. I’d hardly call Ziggy Stardust a cheap gimmick. But what about Buckethead, you say. What’s he pretending to be? Um, he was raised by chickens, his face disfigured by their scratches. Having escaped the coop in which he was raised, Buckethead now lives in a dilapidated, house-of-horrors amusement park called Bucketheadland. He wears the bucket in memoriam to all the chickens whose lives were lost to the fast food industry—or so the story goes. The truth, however, is just about as strange as fiction… and the fiction is awfully strange. Buckethead is played by Brian Carroll, a 48-year-old California native and mostly a man of mystery. There are very few available photos of him without the mask, and there’s only one known recording of his natural speaking voice, in an episode of the self-help podcast “Coming Alive: How to Become the Person You’re Meant to Be.” Interviewed by psychotherapist Barry Michels, Carroll comes across as heartbreakingly sincere and painfully shy. He speaks—haltingly and inarticulately—about the painful loss of his parents, his recent health problems, and the fear and insecurity that led to his public personae. Every other interview he’s ever given was conducted through the use of “Herbie,” a wretched, gravel-voiced hand puppet. Really. Despite all the lurid horror imagery that surrounds Buckethead, the things we know about Carroll reveal a gentle, childlike figure. Having grown up near Disneyland, he spent much of his youth there and has, for at least 20 years, been working on a tribute album. He regularly plays “When You Wish Upon a Star” and “Yo Ho (A Pirate’s Life for Me)” during his live shows. And then there’s the breakdancing and robotic pantomiming, a nod to Michael Jackson. (For someone who stands six and a half feet tall, Carroll possesses impressive physical control.) The Michael Jackson homage is furthered by several songs that directly reference him, notably “The Return of Captain EO” and “The Homing Beacon - A song for Michael Jackson.” Similarly, in tribute to Bruce Lee, Buckethead demonstrates his astonishing nunchuck skills at every show. 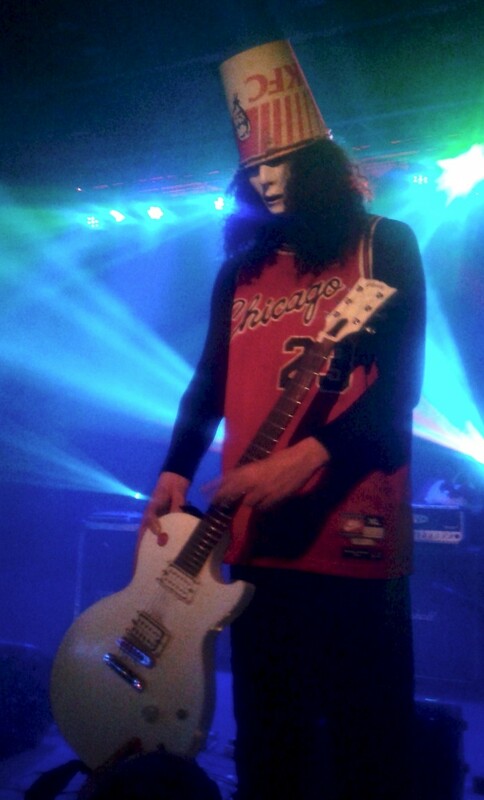 And lately, as he did in Buffalo and Cleveland this week, he’s been wearing a Michael Jordan jersey on stage, an athlete he’s repeatedly honored in song, going so far as to release an album in 2016 called “Happy Birthday MJ 23.” Even the white mask comes from his love for horror films like Texas Chainsaw Massacre. In other words, Brian Carroll makes a point of reminding us that he’s first and foremost a fan of pop culture, perpetually in awe of his heroes. And if the aforementioned doesn’t paint a picture of a grown man with a boyish love for the world, during every Buckethead show, Carroll will — looking like a demented Santa Claus — pull out a big bag of toys and personally hand them out to the people in the first few rows. As a work of conceptual art, it’s multi-pronged and overwhelming to digest, but the shows wouldn’t sell out if he weren’t such an innovative guitarist. Buckethead’s long, thin fingers offer incredible reach and dexterity. Rock guitarists have been two-hand tapping since the 1970s, but Buckethead simultaneously taps on multiple strings, using all four of the fingers of both hands. He’s perfected use of the “kill switch,” a button specially hardwired into the guitar that momentarily cuts off (or kills) the signal. He taps the button so quickly and rhythmically that the guitar assumes the sound of a DJ at the turntables. Further, he’s the only guitarist I’ve ever known to employ a right-hand funk-slap technique ordinarily reserved for the bass guitar. And then, of course, there’s the precision and speed. Buckethead’s notes are astonishingly machine-gun-fast. There are critics who dismiss his playing as pure pyrotechnics, but then they’re not really listening. Buckethead is not only an impressive technical player, but he has a way with melody that many (much more recognized) guitarists lack. Put it all together, and he’s in a category all his own: artist, gunslinger, showman. Artists who are revered for their technical prowess or musical genius seem to push the boundaries of what is humanly possible. Consequently, we expect them to be larger than life. The very word “star” implies that they exist above us, like gods. 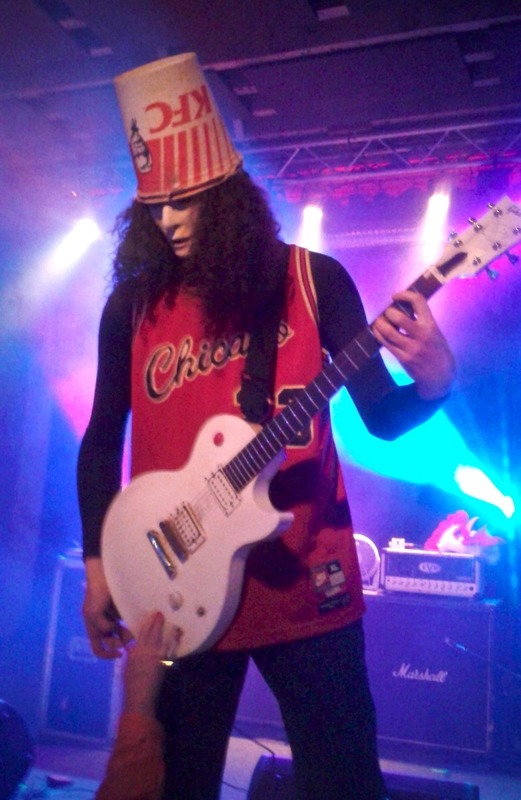 This is why Buckethead and similar costumed rock stars go over so well with a crowd. They’re not presenting as human; they rejects their own humanity. 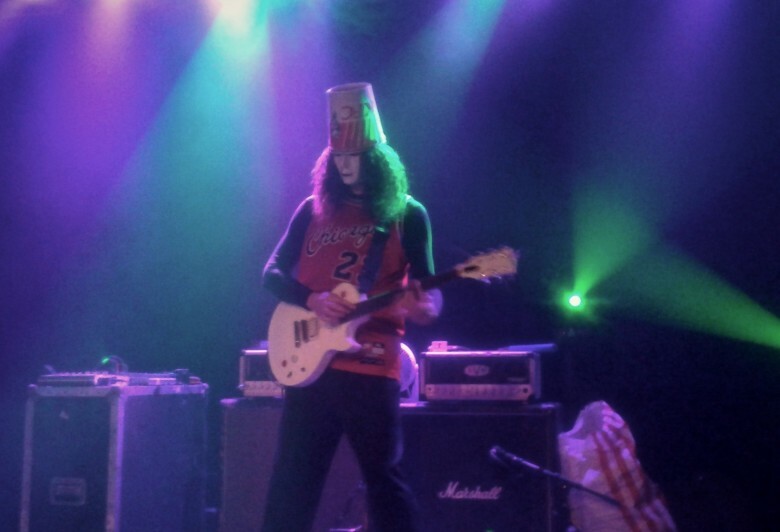 In fact, the less human Buckethead appears on stage — moving in staccato motion as if he were an android — and the less his instrument sounds like a guitar — beeping like a computer or growling like a beast — the more the audience goes wild with approval. His prodigious output also adds to the perception that he’s not like the rest of us. For instance, he released 118 albums in 2015 alone, going so far as to release an album every day for the month of October. Let me repeat that. He released an album every day for a month… and released an additional 87 albums that same year. It seems humanly impossible. But Buckethead, the larger-than-life inhuman character, is ultimately a tragic figure — abandoned by humanity, largely mute, unable to express emotions without the aid of his guitar. His music is often disjointed and unnerving, downright terrifying at times. The album titles alone can be troubling: “Slaughterhouse on the Prairie,” “A Ghost Took My Homework,” and “Teeter Slaughter.” His home, Bucketheadland, is dystopian at best. This is where I think that Buckethead, as a work of conceptual art, is brilliant. We are drawn to this fictitious, dysfunctional world, because, in it, we see our own failed humanity. The world we’ve created for our amusement — television, the media, the Internet — often feels harrowing, broken, and dangerous. Like Buckethead, we are trapped in a park of our own creation. We, too, are scarred and mute, unable to communicate amongst the noise. Whether he knows it or not, Buckethead has scored the discomforting soundtrack to our postmodern, 21st century nightmare. There is also something uniquely American about Buckethead — the reinvention of identity; the idolization of American pop culture heroes; the appropriation of KFC, a symbol of the South’s racially complicated culture. His music is a melting pot of genres: metal, funk, blues, techno, bluegrass, and experimental. Is the featureless white mask a commentary on the moral bankruptcy of white America? I’m probably thinking too much about this. Isn’t this supposed to be a show review? If you were to walk through Iron Works last Monday, making sweeping generalizations about demographics and musical genres, you’d have a hard time guessing what type of act you were about to see. While most of the front row had white hair, I saw just as many underage concert-goers with large Xs painted on their hands. There were probably more people of color than you might expect at a metal show, but then, having worked extensively with founding funk artists like Bootsy Collins and Bernie Worrell, Buckethead is much more than a metal guitarist. And that probably explains the diversity of the crowd. Hippy jam-band fans, Primus fans, Guns N’ Roses fans, nu-metal fans, and guitarists of all shapes and shades came to see the master perform his tricks. Escorted by a stagehand, Buckethead made his entrance with little fanfare. There was no band, only a pre-recorded backing track playing from a docked iPod. Much of it, I suspect, was synthetic or at least constructed from drum samples. It’s likely the secret to his prolificity. He played for two hours straight, stopping only once to dance, nunchuck, and hand out toys. So familiar was he with the sequencing of the backing track that he kept perfect time during lengthy rests. Songs were carefully paced, weaving slow bluesy numbers with wild cacophony and everything in between. Having seen the Cleveland and Buffalo shows in short succession, I noted only three mild deviations between the two. First, and only occasionally, he would manually advance to the next pre-recorded track, perhaps tiring of a song, or sensing a lack of energy from the crowd. Second, when he passed toys out to the crowd, some fans offered him gifts in return. (I noticed a Dexter figurine at the Buffalo show.) Buckethead acknowledged gifts with a physical gesture of appreciation that differed each time. Finally, during both shows, Buckethead took off his guitar and held it out to the front row so that they could play the kill switch, to varying results. If he was pleased with a participant’s performance, they were rewarded with a gentle handshake. Then, just as he entered, Buckethead left the stage with no razzle-dazzle, just a small wave of the hand. A brief YouTube search will reveal that he's been doing this same show, or something quite like it, for years... and for the believers, it will never get old. I will admit that there were moments when I felt as if maybe I'd seen and heard enough, that he was basically cycling through the same tricks I'd already seen him do. But those moments never lasted long. Buckethead deftly engineered the show to orchestrate an energy in the room. I felt it in Cleveland, and I felt it in Buffalo. Live music is about forging a connection between artist and audience. We go to a venue to be in the artist’s presence. We want eye contact. We want to shout out song requests. We want the artist to speak to us, to say the name of our town — Hello, Buffalo! In turn, the artist feeds off our excitement, our cheers. We become part of the creative process. But Buckethead has subtracted so much of the live show experience from his act, leaving us with little to focus on but his guitar playing. That he was able to sustain our interest for two hours on that alone — no band, no banter, no face — is remarkable. Brian Carroll has combined stunning virtuosity, mystery, showmanship, and a dash of absurdity to great effect. That he’s also extremely prolific and reclusive only makes him a more compelling figure. If you’re not sure where to start digging into his massive discography, a Dutch computer engineer built this “pike suggester.” (Buckethead “pikes” are a series of numbered albums released as if they were comic book issues). Simply indicate what types of music you like, and the program will suggest Buckethead albums to reflect your tastes. As I alluded to earlier, Carroll has recently revealed that he has a life-threatening heart condition for which he has undergone surgery. Much of Buckethead’s lore is macabre in nature, so I’m just going to say it, no matter how insensitive it may sound — go see him before it’s too late. Buckethead is an American treasure.